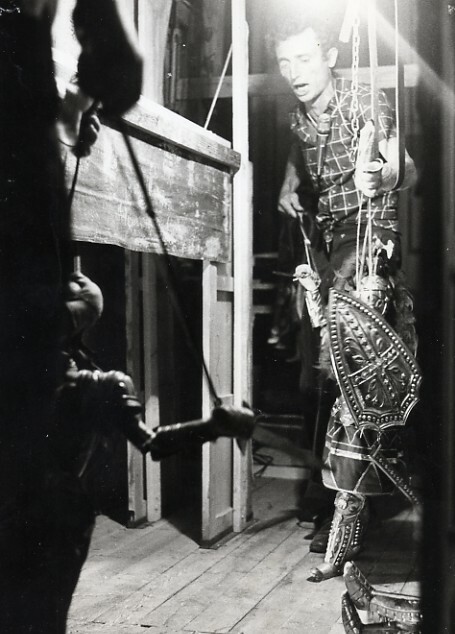 The Company “Charlemagne” was founded by the Enzo Mancuso, last descendant of the namesake family of puppeteers who started the business in Palermo in 1928, opening a puppet opera theater in the neighborhood Old Village. 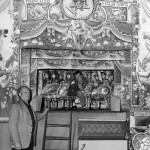 The Mancuso Antonio Cavaliere, student of the puppeteer Partridge, moved its theater in several areas of Palermo and in various countries of the province, Also with the invention of a theater fixed above a truck , up to activate a permanent theater in the square in Palermo Don Luigi Sturzo, that remained active until his death, in 1988. 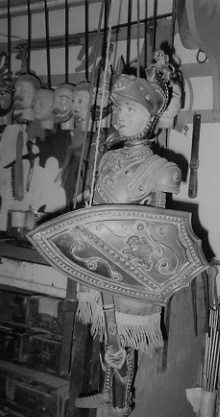 The horseman was Mancuso great innovations in armor with helmets to Greek and Roman; for the performances of the shows made use of the aid of the children Nino, Pino and Stephen; had national notoriety by participating in Doubles or Nothing, one of the first broadcast on Italian TV, as expert History of the Paladins of France. 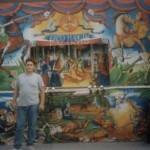 The Cav. Antonino Mancuso, grandfather of Enzo, and, backstage, Uncle Pino. 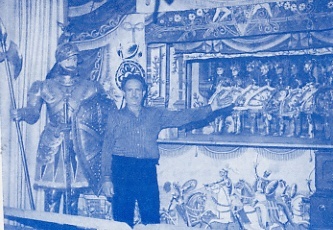 His son Nino, Born in Palermo in 1934, age of 14 year staged its first cycle of the history of the paladins of France, in 360 evenings, in the country of Misilmeri near Palermo and continues to work with his father until his death; Nino is still a skilled puppeteer and is considered an expert manufacturer. Of his children only Enzo follows in the footsteps. 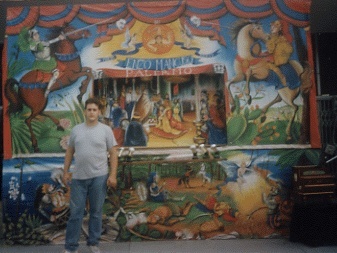 Enzo, Born in Palermo in 1974, is the owner of the company and therefore the son and grandson of art; takes the job as a child as a helper, begins at 13 very early years as a puppeteer with his first show “Death of Agricane”. 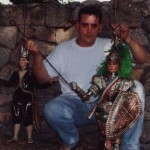 Restores some puppets inherited from his grandfather and started his own business in 1994. 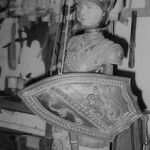 With the teaching of his father and uncle is dedicated to building the puppets, using the ancient techniques of old masters, putting on a few episodes from the history of the paladins of France. 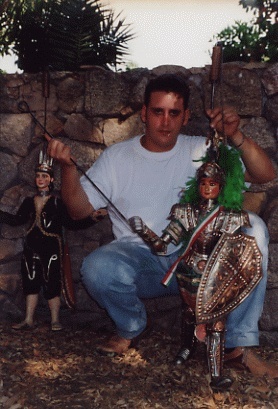 The young Enzo Mancuso, now considered the youngest puppeteer Palermo, has not stopped learning the techniques of construction and operation, but thorough study of old “dishcloths” and perfected the technique of acting. 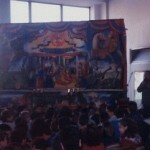 In 1999 puts on his show entitled Experimental “Opra crowds: puppets, cuntu and farce” by which manifests, beyond love for puppets, interest in the Cunto, ancient form of oral storytelling. 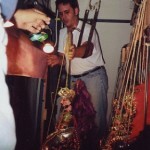 His company called Charlemagne has participated in several editions of important theater festival Figure: Morgana Festival and Puppet Night organized by the International Puppet Museum in Palermo; organized by the Machine of Dreams “Children art Cuticchio”; Review of the puppet theater organized by the Municipality of Sortino; at 30 ° Festival of Saint Archangel. 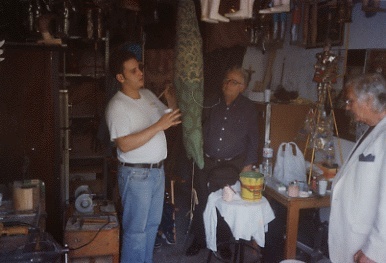 In 2000 Enzo Mancuso is called to lead a workshop(construction of puppets and puppet) in the auditorium of the Leonardo da Vinci Education Office of Palermo. 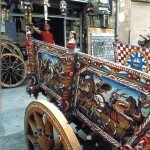 From 1999 to the 2005 The company is entered several times in summer events sponsored by the City of Palermo (The whole scene of Palermo and Palermo). 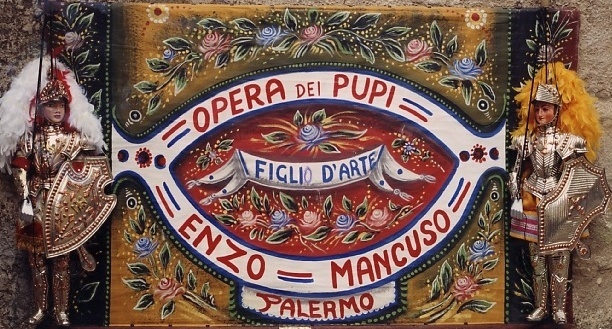 Even in 2002 Enzo is called a master-builder of the didactic and laboratory premises “Pallavicino” Palermo. 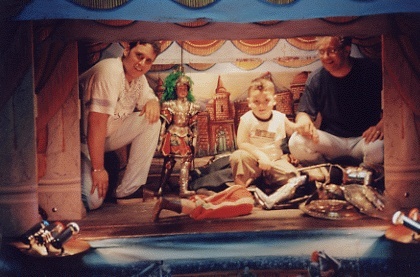 In 2003 Enzo opens a puppet theater in the Opera by way of Mary College in the Old Village neighborhood in Palermo, and each year organizes a superb program of shows. 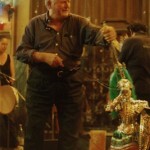 in 2004 takes part with his performances in a big project called P. It. 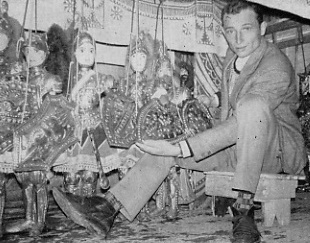 M. (Partnership Ethnografic Museums) and within this partnership between European ethnographic museums was present with his puppets at the Museum of Ethnography de Castilla y Leon (Zamora - Spain), the Musée de Normandie(Caen - France), to Muzejso Ethnografphic Brivdabas in Latvia and the Museum of Uses and Customs of the People of Trentino in Italy and precisely in Trento. 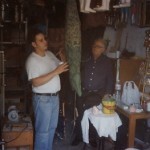 In 2005 Enzo Mancuso and her company in the project “grandparents to school” is called to lead a workshop for high school construction and states in state”Galileo Galilei”(PA) from past experience and strong by 2005 to the 2007 for the project “Snow White” for three years as a teacher is called to conduct a laboratory where he saw committed 10 school children P. Novelli of Monreale in the construction and recitation of the Sicilian puppets. 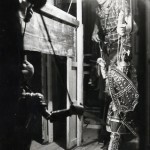 In 2007 for the Municipality of Palermo has been assigned the task of restructuring the puppet theater of the Museum's ethnographic G. Pitre and inaugurate the 27 March with its new shows at the Museum (Palazzo Tarallo). 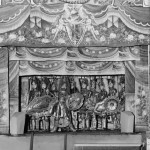 Again, As in previous years, and precisely the 20-21-22 April 2007, his puppet theater “Charlemagne” was adopted by the pupils of D.D. 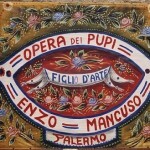 The Masa at the event “Palermo opens the doors - the school adopts the town”. 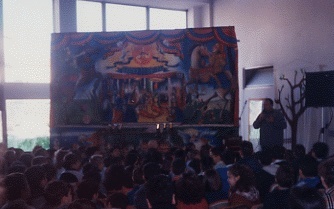 This project, collaborative effort between the Department of Education and the Educational Policies of the City and the elementary schools, middle and high schools of the city is an event that engages school leaders, teachers and students, transforming them in guidebooks and has as its goal the education law through the appropriation of the local. 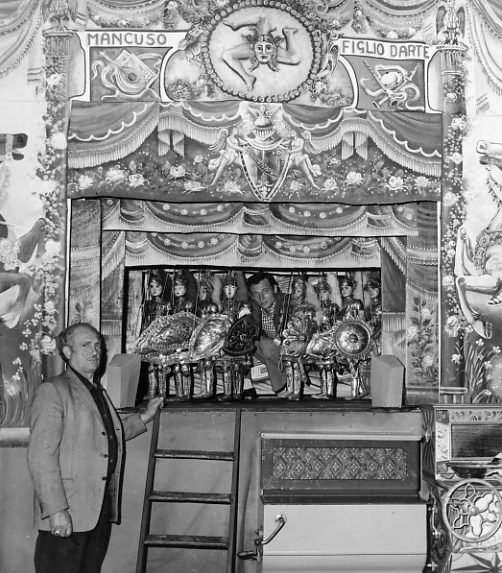 Also in 2007 his company, namely in July was present as a special event of the summer festival called “Summer 2007 In house Badoer” with its impressive performances in the spaces of Villa Badoer (stated in 2005 intangible asset of humanity by UNESCO ) in Polesine - Rovigo. 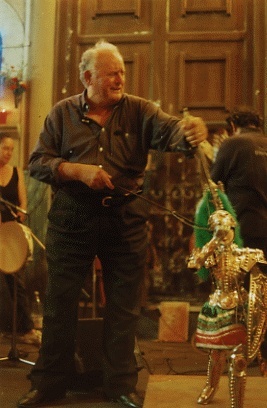 In 2008 in the month of May was present with his performances of traditional Sicilian puppets in Miranda de Ebro in Spain, respectively(Centro Cultural de Caja de Burgos), Burgos(Cultural Cordon- Caja de Burgos) and Aranda de Duero(Centro Cultural de Caja de Burgos), while in Germany in Bonn, the company has represented Sicily with a mini series of shows in the auditorium of the Kunstmuseum. 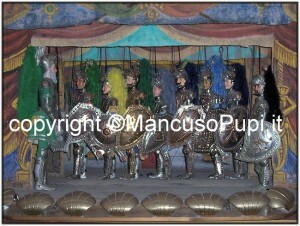 Also in 2008 in November the company with the show of puppets “death of the giant Gattamugliere” participated in the 1 ° “Storytellingfestival” organized by the Museum House of Antonino Uccello Palazzolo Acreide (Syracuse). 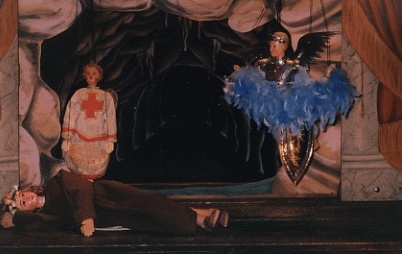 In 2009 within the XXXIV Morgana Festival organized by the International Puppet Museum in Palermo, the company accounted for two new productions on 28 November and 04 December respectively entitled "Rodomonte the battle of Paris and Cloridano and Medoro" and rinsavimento Orlando and triple duel of Lampedusa ". 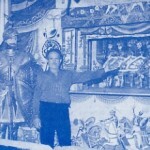 In 2009 within the XXXIV Morgana Festival organized by the International Puppet Museum in Palermo Company represents two new productions in data 28 November and 04 December respectively entitled "Rodomonte the battle of Paris and Cloridano and Medoro" and rinsavimento Orlando and triple duel of Lampedusa ". 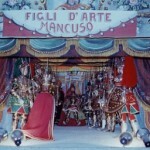 Also in 2009 for the third consecutive year for the entire December period organizes in its theater "Charlemagne" via the College of Mary,17 (Area Port of Palermo) the Review entitled "The tradition is art" where in addition to hosting other companies puppeteers, performing young storytellers and cuntastorie great talent.. 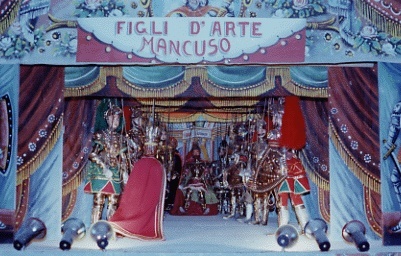 In 2010, precisely in the first decade of August, is inaugurated with the shows of puppets "Orlando free Angelica" and "Thirteen wounds Rinaldo" the opening of the former tuna factory Florio of Favignana. 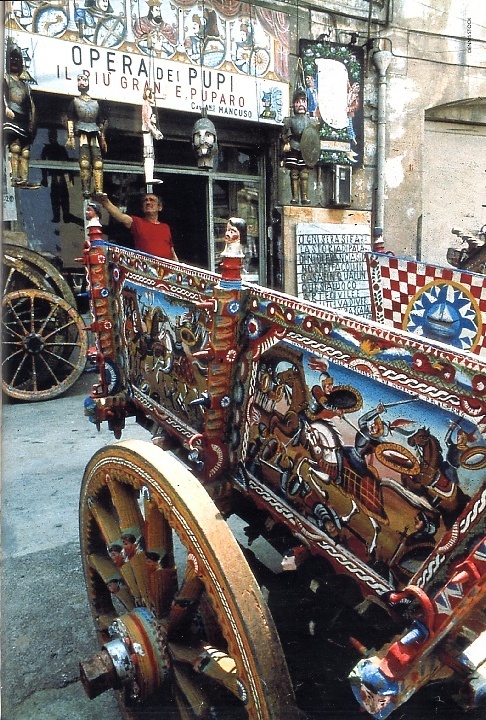 Also in August, the company Charlemagne is inserted in the summer program of the City of Bagheria(PA) and the billboard "summer Ambrosiana" Cefalu(PA). 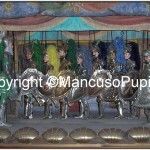 As in past years, the company in November participates in the XXXV Morgana festival organized by the International Puppet Museum in Palermo representing n. 5 performances of the show "Carousel banned Charlemagne". 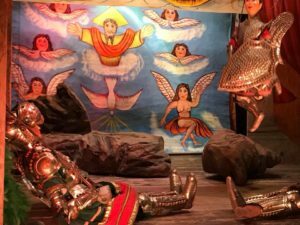 In December, "The association Charlemagne" under the artistic direction of Enzo Mancuso was involved in the organization of the fourth edition of "Christmas traditions", exhibition of puppets, cuntastorie and storytellers. 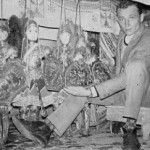 Lastly, once again, As in previous years, Association Charlemagne under the artistic direction of Enzo Mancuso was committed in the organization of the V edition of "Christmas is tradition", exhibition of puppets, songs and cunti. 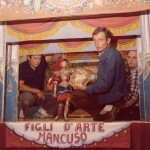 In 2012 the Association in their own theater of puppets from the first months organizes a series of shows intended for a circuit entitled "Sicilian Puppet Shows"; always in 2012 on behalf of the Province of Palermo is called to lead a workshop on building Sicilian puppets entitled "The Art of the puppeteer", interested schools were: D.D. 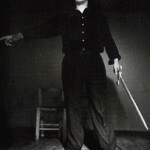 Palmeri Termini Imerese, D.D. 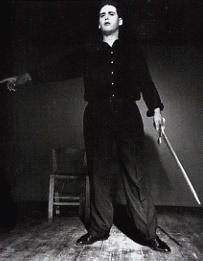 Luigi Pirandello Bagheria and Almejda Palermo. 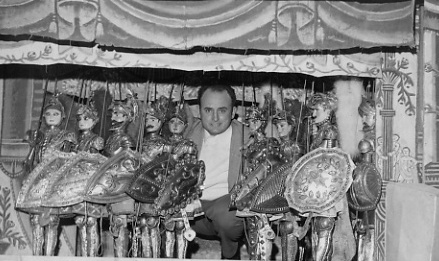 In summer the company with the show of puppets "Agricane the Tartar King "was present in Trabia, Ficarazzi, Lucca Sicula; the 21 and 22 October the company always with the puppets was present in Saluzzo(CN); while at Christmas for the 6th consecutive year organized the exhibition "Theatre and traditions ". 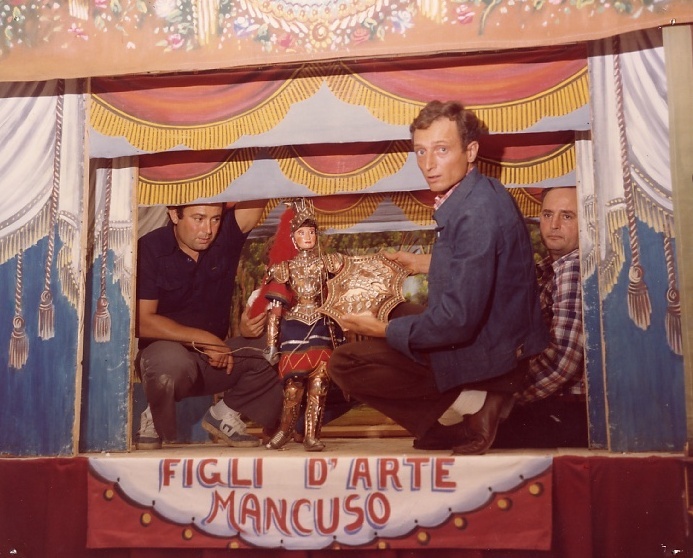 In 2013 the company given its success has repeated the experience organizing the 2nd edition of "Sicilian puppet Shows"; In May, the company was present in Rome doing a mini cycle performances of puppet theater Saint Lucia, while in June on behalf of the Italian Institute of Culture of Luxembourg with the show "The duel of Orlando and Rinaldo" was present in the municipal theater Esch- in Esch- sur-Alzette(Grand Duchy of Luxembourg). 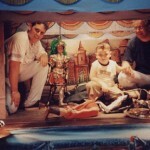 In summer the company with his puppets was present in Ficarazzi, Misilmeri, Termini Imerese. 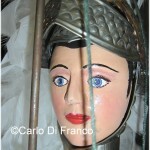 At Christmas this year organized the 7th edition titled "Christmas Traditions" exhibition of puppets, food e canti. 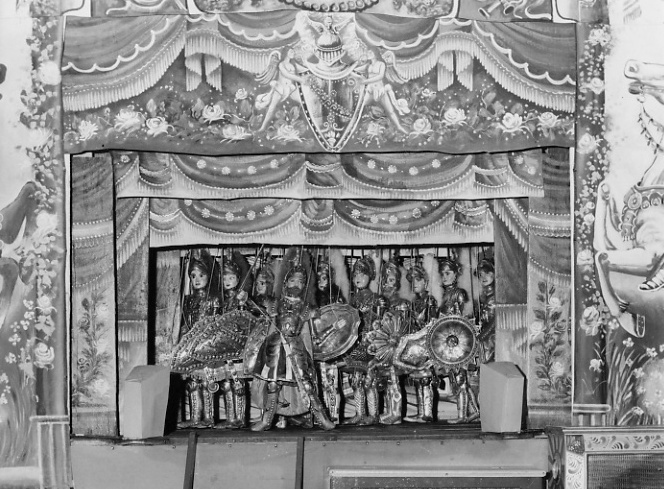 2014 – Also this year in our stable of puppet theater "CHARLEMAGNE" site in the district of Borgo Vecchio Palermo have revived programming stable of shows of Sicilian puppets in episodes related to the History of the Paladins of France; over the months we have represented : Death of King Pepin of France, The Farse of Nofriu and Virticchiu, The Adventures of Charlemagne, The Birth of Orlandino, Ruggiero Free Milone, Gratitude of Buovo with her children, The Death of the King of the Tartars Agricane, The Giant enchanted by the voice, The Adventures of Ruggiero of Africa, Arrival of Angelica in Paris, The Madness of Orlando and Duel and love between Bradamante and Ruggiero. 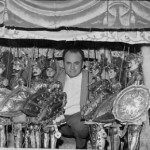 IL 6 December at the International Puppet Museum in Palermo in memory of the Knight Nino Mancuso, disappeared in August 2013 , we organized an evening in memory of Maestro Nino Mancuso where the occasion was shown a video of Joseph Sinatra "The voices of Angelica" where assembled the most important moments of life of Nino Mancuso as puppeteer. 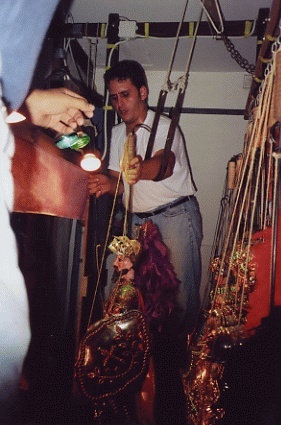 Also in the month of December and precisely the 18-19-20 once again under the patronage of the Municipality of Palermo we represented in our stable theater Palermo n. 3 performances of the show "The Facts of Malaguerra" and the workshop "La Bottega del puppeteer - born as a baby".